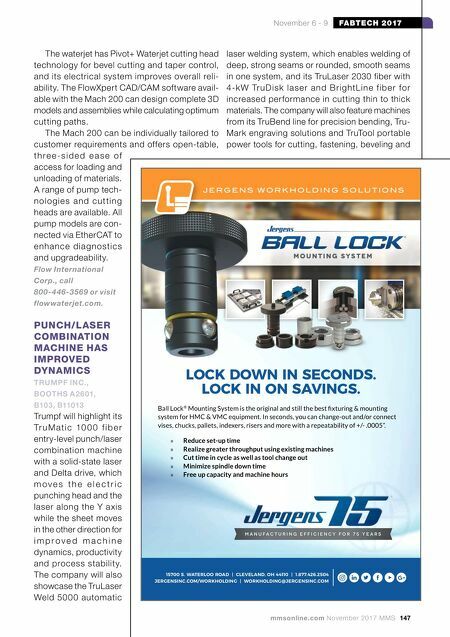 146 MMS November 2017 mmsonline.com FABTECH 2017 November 6 - 9 COMPLEX FORMS NEED STRAIGHTFORWARD SOLUTIONS: VOLLMER Whoever wants to shape the future will need forward- looking rotary tools – and intelligent solutions for their production, processing and maintenance. VOLLMER sup- ports you: with innovative sharpening and eroding machines to suit virtually every requirement. With eco- nomical automation options and strong services. For the highest possible fl exibility, effi ciency and quality of results. The future takes shape: with precision from VOLLMER. VOLLMER OF AMERICA CORP. // 105 Broadway Avenue // Carnegie, PA 15106 info-us@vollmer-group.com // Phone: +1 412-278-0655 VOLLMER VPulse 500 VOLLMER VGrind 360 www.vollmer-group.com Whoever wants to shape the future will need forward- looking rotary tools – and intelligent solutions for their production, processing and maintenance. 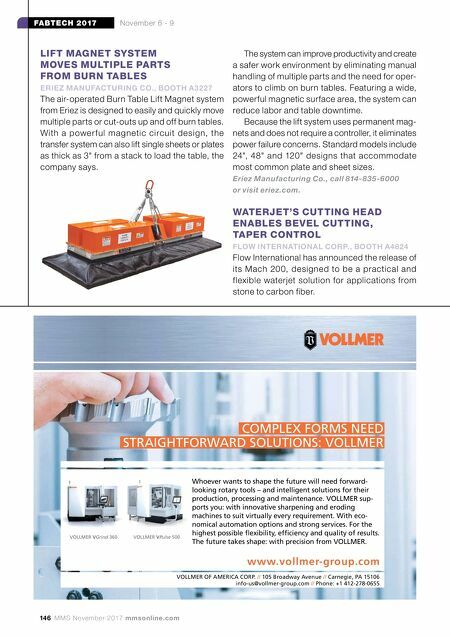 VOLLMER sup- ports you: with innovative sharpening and eroding machines to suit virtually every requirement. With eco- nomical automation options and strong services. For the LIFT MAGNET SYSTEM MOVES MULTIPLE PARTS FROM BURN TABLES ERIEZ MANUFACTURING CO., BOOTH A3227 The air-operated Burn Table Lift Magnet system from Eriez is designed to easily and quickly move multiple parts or cut-outs up and off burn tables. With a power ful magnetic circuit design, the transfer system can also lift single sheets or plates as thick as 3" from a stack to load the table, the company says. The system can improve productivity and create a safer work environment by eliminating manual handling of multiple parts and the need for oper- ators to climb on burn tables. Featuring a wide, powerful magnetic surface area, the system can reduce labor and table downtime. Because the lift system uses permanent mag- nets and does not require a controller, it eliminates power failure concerns. Standard models include 24", 48" and 120" designs that accommodate most common plate and sheet sizes. Eriez Manufacturing Co., call 814-835-6000 or visit eriez.com. WATERJET'S CUTTING HEAD ENABLES BEVEL CUTTING, TAPER CONTROL FLOW INTERNATIONAL CORP., BOOTH A4824 Flow International has announced the release of its Mach 200, designed to be a practical and flexible waterjet solution for applications from stone to carbon fiber.